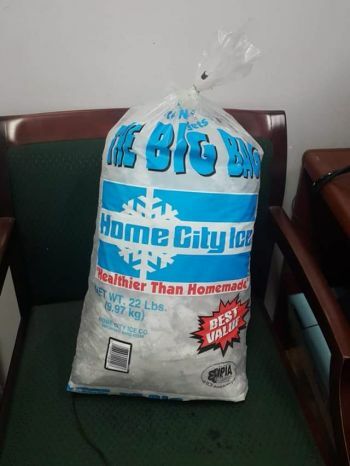 ROAD TOWN, Tortola, VI - Allegations were made against Honourable Mark H. Vanterpool (R4), Minister for Communications and Works by a disgruntled resident who stated that One Mart is selling a bag of ice for $10. The resident voiced their frustration on their social media platform. "When I tell you all Elton (Bobby's Supermarket) is the real people's man... and need to be branded the people's store (not One Mart)... If you see the size of ice One Mart selling for $10...and he (Hon Vanterpool) was quick to jump on the news bout "no price gouging at my store", said the displeased customer on social media. Meanwhile, yesterday October 3, 2017, Hon Vanterpool fired back on his Facebook page to shut down all claims and reassured customers that One Mart is not part taking in price gouging. He said, "I find it necessary to clarify a recent attack on One Mart that was posted on social media. I stand by our competitiveness and reiterate that there is no price gouging at One Mart". He further commented that at a time like this, persons tend to get "discouraged, frustrated and negatively emotional, but encourages everyone to stay positive". Recently, Director of Trade, Karia J. Christopher, operated an undercover surveillance of local businesses that were accused of price gouging. It is not clear what has been unearthed. Engaging? How bout 5 finger discounting generators and selling them at marked up prices. So shameful. Almost got in sucked today with those generators. Ridiculously high priced. Check the price at Costco. The hurricane ain't teach you nothing. went to that supermarket the other day and they had 6 aaa batteries for US$20.00. Just ridiculous. And where has the same brand battery and amount you bought cheaper? Just to add my 2 cents; 6 batteries either 3 packs with 2 each or one with 4 and one with 2 does not normally cost $20 so if this is true either Mark was ripping customers off from the start or he is now price gourging. it was a pack of 6. I have bought batteries there before and they were not that expensive. I did go to another establishment and bought an 8 pack for US$13. and change. "Voter" has it right. Whether Mark is lying or not, who knows, but his reputation (and that of other ministers) makes one tend not to believe. It is the old story of crying wolf too many times!!! Sorry Mark but those years of fooling the people are now catching up. One problem I have with this is there is no seperation between Mark the representative and Mark store owner.